We all know what a crack is when we see one. So what do we do about it? This guide attempts to establish a framework of knowledge about how cracks are viewed in the aircraft industry. 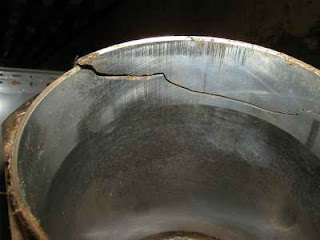 A crack is a type of discontinuity brought about by tensile stress the result being that things are no longer held together. This definition establishes that a crack is a sign of impending failure that prompts a course of action when found. You have to do something about it. 2. What to do about it? All detected cracks are a concern, regardless of their size. Leaving a crack in situ is rarely an option. 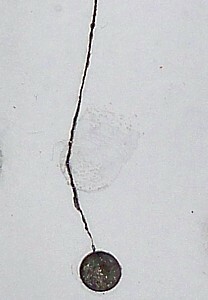 Many aircraft fly with known cracks if engineering demonstrates that the residual strength exceeds ultimate load; including crack growth until the next inspection. What to do about it is the decision of engineering presented through the aircraft's maintenance instructions. Most modern aircraft use a SRM (Structural Repair Manual). This is the key item of importance to the mechanic--the mechanic must defer to engineering or appropriate maintenance instructions as to the proper course of action when a crack is discovered. It is not in the mechanic's (nor aircraft owner's) area of expertise to access residual strength and crack growth rates. Stop drilling is not a repair; it's a temporary intervention. A stop drill hole does not properly restore the load-carrying capability of the structure and the underlying structural problem is still not properly addressed. Shortly before the right wing broke off of a Turbo-Mallard (N2969) killing all 20 people aboard, at a meeting with pilots the following comment was made: "the maintenance supervisor told them that the skin-cracks in the airplanes were superficial." NTSB accident report NTSB/AAR-07/04. "It is the Small Airplane Directorate's policy to not allow continued flight with known cracks in primary structure. An airplane with a known crack in the primary structure no longer meets its type design and may no longer possess (sic) its type design strength. This policy applies to all normal, utility, acrobatic, or commuter category airplanes, regardless of certification basis." Excellent read, I just passed this onto a colleague who was also looking for it, And he actually bought me lunch because I found it for him. So I should thank you for the free lunch I got.